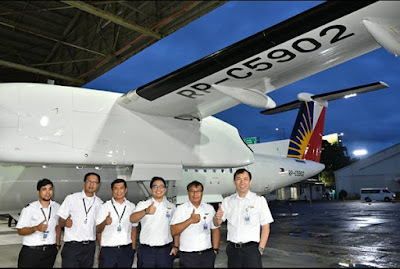 Aviation Updates Philippines - Philippine Airlines' second bi-class next generation Bombardier Q400 touched down in Manila recently after traveling approximately 11,400 nautical miles from Toronto to Manila with nine stop-overs. NEXT GENERATION AIRCRAFT. PAL Express received its second brand new Bombardier Dash 8 Q400NextGen aircraft. This new aircraft will be utilized to ply inter-island domestic routes in the country. Photo by Philippine Airlines. The 86-seater plane, to be utilized for select intra-domestic routes, departed from Toronto and made technical stops in Newfoundland (Canada), Lebourget (France), Malta, Egypt, the United Arab Emirates, Pakistan, India, Bangladesh and Thailand before landing in Manila. An aircraft blessing was likewise held with PALex President Bonifacio Sam in attendance, together with PAL VP for Security Gen. Ronnie Ordoyo, PALex VP for Flight Crew Operations Edgardo Diaz, PALex AVP for Commercial Group Rabbi Vincent Ang, Bombardier Area Field Service Representative Rajeev Sharma, PALex AVP for Maintenance & Engineering Johnny Contreras, PALex Material Planning Manager Jesus Ceasar Filomeno and Bombardier Area Field Service Representative Willy Furqa. PAL and Bombardier have earlier signed an agreement in the Paris Air Show for the purchase of 12 Next Gen Q4s; the remaining 10 units of which will be delivered within 2017 - 2019. Fleet modernization, together with flight route network expansion and service innovation, is a priority area of the PAL Group as the airline aims to achieve five star ratings and be the airline of choice in all markets it serves.